Helictotrichon sempervirens, the Blue Oat Grass, resembles a really large grey fescue. Helictotrichon sempervirens just looks a bit more casual and relaxed. The Blue Oat Grass will typically grow to a foot or more in height. Tan flowering spikes extend a few inches beyond the foliage in the Spring. Helictotrichon sempervirens is evergreen near the coast. Where temperatures dip into the teens Helictotrichon sempervirens plants will look a little tattered and will look their best if cut back close to the base at the end of the season. Helictotrichon sempervirens grows in full sun or light shade. Blue Oat Grass is tolerant of dry conditions but prefers somewhat regular water. 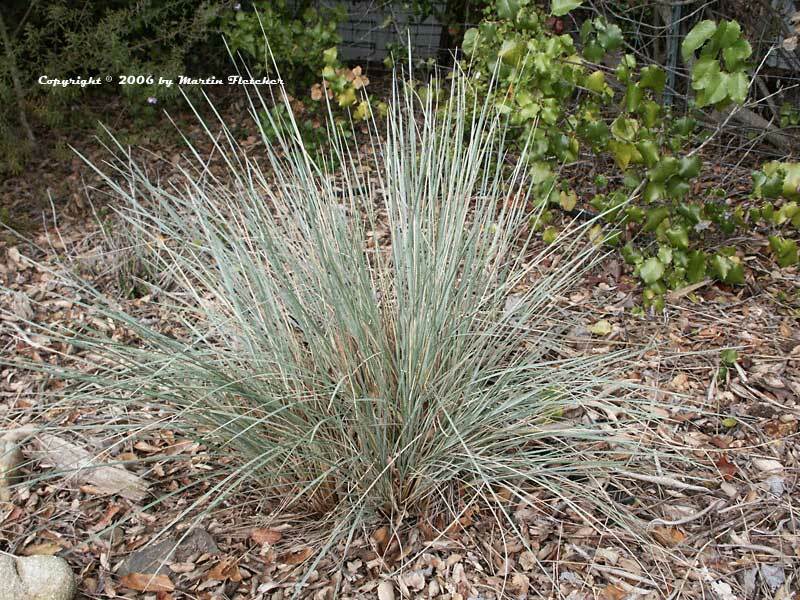 Blue gray foliage of Helictotrichon sempervirens - Blue Oat Grass. High resolution photos are part of our garden image collection.